Where are the gay leaders decrying the murderous homophobia under Islam? Licking Linda Sarsour’s boots, I’m sure, wholly indifferent to the new charges that Sarsour enabled sexual assault in the offices of her Arab American Association. The ongoing irony is that LGBT leadership stands with adherents to this viciously homophobic ideology that calls for their slaughter. Last year, I spoke at an LGBT event at the RNC decrying the treatment of gays under Islam, and the mainstream media attacked the event with a vengeance. This is gay leadership. They condemn me (and my colleagues) who oppose the most brutal and extreme ideology on the face of the earth, while stumping for their executioners. They were loud and proud against our ads. They were holding press conferences condemning me. Gay organizations in America say nothing about this, but loudly condemned my ad campaign highlighting Muslim oppression of gays under the sharia. That includes the San Francisco Board of Supervisors, the Human Rights Commission, SFHRC head transgender Theresa Sparks, but most especially the enemedia. They called our ads hate and issued a resolution condemning our AFDI ad campaign (the first of its kind) against our organization for merely quoting Muslim political leaders, spiritual leaders and cultural voices in the Muslim community who call for the torture and death of gay people. This incident took place in Theresa May’s Britain, which I am banned from entering because I oppose jihad terror. But the savages who did this were welcomed. Police are hunting a suspect after gay men were punched and told “you are not welcome” in east London. One of the victims was punched to the ground and left with a black eye after he was attacked in Walthamstow late on evening. Another victim was grappled with and told “you are not welcome” as he walked along the high street with his husband after a night out. 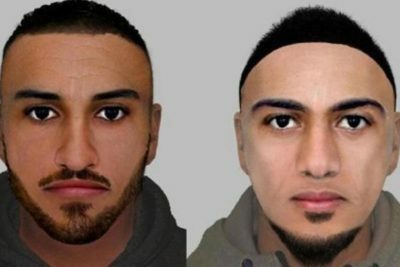 Police have released two e-fits based on detailed descriptions from both victims and are investigating the possibility that the attacks were carried out by the same man. In the first attack on Sunday, October 8, the first victim, a 47-year-old man, was walking along Walthamstow High Street with his husband after a night out in Walthamstow Village. They were approached by a man who asked them if he could take a picture of them and then asked if they were gay. Police said the two men walked away but the suspect then grabbed hold of the victim and said “you are not welcome” and grappled with him. The victim was then pulled away by his husband before they walked away and called police. He was not injured. In the second attack on Saturday, November 4, the victim, a 31-year-old man, was walking along Hoe Street with two friends. They were approached by three men who they did not know. One of them allegedly punched the victim in the face and shouted homophobic abuse at him. The attacker fled, police said….